I only started Andrew's book yesterday and I haven't been able to put it down. It is BRILLIANT. Honest, gritty and an incredible-I suspect unique-portrayal of the cutting edge high altitude climbing scene of the nineties into the present day as he describes his own odyssey that culminates in his ascent of all fourteen 8000-metre peaks. 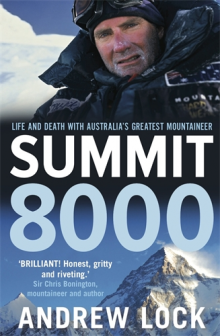 Andrew Lock has written a superb and very honest account of climbing all the 8000-metre summits and the connection he made with the Himalayan mountains, the Himalayan people and the Himalayan climbers he met along the way. In this book you will discover how, time and time again, a man can draw on his inner strength and also that he does not suffer fools gladly. Here Andrew Lock gives us a gripping account of his death-defying ascents and explains his passion for climbing in small teams, or solo, without Sherpas or bottled oxygen. Andrew’s story is one of extraordinary passion, self-motivation, perseverance and resilience, as he leads us through his sixteen-year odyssey to achieve the Grand Slam of Himalayan mountaineering. We are taken through the victories, the near-misses and the great tragedies. The intense human drama of the expeditions infuses the book—sometimes funny, sometimes fierce and always fascinating stories about survival, climbing rivalries and mountaineering politics. The remote and stunning landscapes and cultures that Andrew encounters on his journeys add rich texture to his tale, culminating in his 2014 trip to Everest, where he was witness to the deadliest avalanche in the peak’s history. Ultimately, we learn ‘why does he do it?’ Why does anyone take on such a challenge, knowing how easily they might be killed? Andrew’s story is both candid and inspiring.